This weekend’s key matchups include #1 Florida @ #10 LSU where the Gators took game 1 5-4. #4 Florida State traveled to #5 Virginia where the Seminoles lost in 11 innings, 4-3. #3 Oklahoma is hosting #16 Texas A&M and the Sooners took the first game 1-0 in a pitchers duel. Adam Conely – LHP – Washington St. – Jr. 6.2IP 10H 3ER 1BB 10K. (L, 4-1) Thursday. Mixed reviews against a good Fresno State team. Sonny Gray – RHP – Vanderbilt – Jr. 7.1IP 4H 0ER 4BB 10K. (W, 5-0). Gray brilliant brilliant again, this time against SEC opponent Mississippi State. Brian Johnson – LHP – Florida – So. 5.1IP 5H 2ER 1BB 1K. Not sharp but #1 Gators get the win against #10 LSU. Matty Ott – RHP – LSU – Jr. 0.1IP 4H 2ER 0BB 0K. (L, 0-1). “Matty Ice” blows a huge save against #1 Florida. Michael Roth – LHP – South Carolina – Jr. 6.1IP 6H 2ER 2BB 8K. (L, 4-1). Cory Luckie – LHP – Auburn – Jr. 3.2IP 9H 4ER 0BB 2K. D.J. Baxendale – RHP – Arkansas – So. 4.2IP 7H 5ER 0BB 3K. Alex Meyer – RHP – Kentucky – Jr. 7IP 7H 2ER 2BB 7K. (W, 3-2). Turning the corner with big SEC win against Tennessee. Taking over for Taylor Rogers in the Friday role? Brandon Kapteyn – RHP – Kentucky – Jr. 2IP 0H 0ER 0BB 3K. (S, 1). DH and 3 hitter also drove in 3 runs. Michael Rocha – RHP – Oklahoma – Sr. 8.2IP 3H 0ER 0BB 13K (W, 5-0) against #16 Texas A&M. Logan Verrett – RHP – Baylor – Jr. 5IP 8H 3ER 2BB 6K. Kind of a letdown after last weeks 14K one-hitter. T.J. Walz – RHP – Kansas – Sr. 7IP 7H 3ER 2BB 6K. (L, 3-3). Danny Hultzen – LHP – Virginia – Jr. 7IP 6H 2ER 0BB 12K. #5 UVA gets the win against #4 Florida State. Sean Gilmartin – LHP – Florida St. – Jr. 7.1IP 5H 3ER 0BB 5K. Mark Pope – RHP – Georgia Tech – Jr. 8IP 3H 0ER 2BB 7K. (W, 5-0). 1 ER in 38.2 IP. 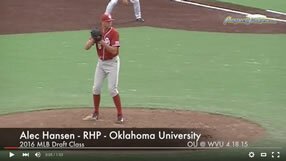 Scott Weismann – RHP – Clemson – Jr. 3H 7H 4ER 1BB 1K. Patrick Johnson – RHP – UNC – Sr. 7IP 7H 3ER 2BB 2K. (W, 4-0). Cory Mazzoni – RHP – NC State – Jr. 5.1IP 8H 2ER 3BB 4K. (L, 1-2). Elliot Glynn – LHP – Connecticut – Sr. 5IP 7H 4ER 3BB 4K. (L, 0-4). 18-3 loss to Rhode Island will move Connecticut out of my top 25. Probably about 3 weeks late. Brian Dupra – RHP – Notre Dame – Jr. 5IP 12H 5H 2BB 3K. (L, 2-2). Kyle Winkler – RHP – TCU – Jr. 8IP 8H 4ER 1BB 11K. (L, 4-1). Only Winkler’s 5th college loss against 23 wins. Austin Kubitza – RHP – Rice – Fr. 8IP 7H 0ER 2BB 10K. (W, 2-2). Anthony Meo – RHP – Coastal Carolina – Jr. 7.2IP 7H 0ER 4BB 5K. Noe Ramirez – RHP – Cal State Fullerton – Jr. Late Game. Will update Saturday. Andrew Gagnon – RHP – Long Beach State – Jr. 5IP 6H 4ER 4BB 6K. Carson Smith – RHP – Texas State – Jr. 7.1IP 12H 3ER 3BB 6K. Andrew Chaffin – RHP – Kent St. – So. 5IP 7H 4ER 3BB 8K. (L, 2-1).